Cape York Peninsula is a large remote peninsula located in Far North Queensland (Queensland, Australia). It is the largest unspoiled wilderness in northern Australia and one of the last remaining wilderness areas on Earth. Although the land is mostly flat and about half of the area is used for grazing cattle, and wildlife is threatened by introduced species and weeds, the relatively undisturbed eucalyptus wooded savannahs, tropical rainforests and other types of habitat are now recognized for their global environmental significance. 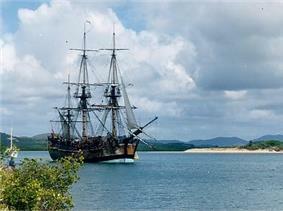 Edmund Kennedy was the first European explorer to attempt an overland expedition of Cape York Peninsula. He had been second-in-command to Thomas Livingstone Mitchell in 1846 when the Barcoo River was discovered. The aim was to blaze a trail to the tip of the peninsula where some Sydney businessmen thought of developing a port for trade with the East Indies. The peninsula was finally conquered in 1864 when the Jardine brothers with eight companions drove a mob of cattle from Rockhampton to the new settlement of Somerset (on Cape York) where the Jardines’ father was commander. En route they lost most of their horses, many of their stores and fought pitched battles with aborigines, finally arriving in March 1865. The west coast borders the Gulf of Carpentaria and the east coast borders the Coral Sea. The peninsula is bordered on three sides (north, east and west). There is no clear demarcation to the south, although the official boundary in the Cape York Peninsula Heritage Act 2007 of Queensland runs along approximately 16°S latitude. At the peninsula’s widest point, it is 430 km from the Bloomfield River, in the southeast, across to the west coast (just south of the Aboriginal community of Kowanyama). It is some 660 km from the southern border of Cook Shire, to the tip of Cape York. The largest islands in the strait include Prince of Wales Island, Horn Island, Moa, and Badu Island. The tropical landscapes are among the most stable in the world. Long undisturbed by tectonic activity, the peninsula is an extremely eroded, almost level low plain dominated by mighty meandering rivers and vast floodplains, with some very low hills rising to some 800 m elevation in the McIlwraith Range on the eastern side around Coen. Around 40 million years ago, the Indo-Australian tectonic plate began to split apart from the ancient supercontinent Gondwana. As it collided with the Pacific Plate on its northward journey, the high mountain ranges of central New Guinea emerged around 5 million years ago. In the lee of this collision zone, the ancient rock formations of what is now Cape York Peninsula remained largely undisturbed. Throughout the Pleistocene epoch Australia and New Guinea have been alternately land-linked and separated by water on a number of occasions. 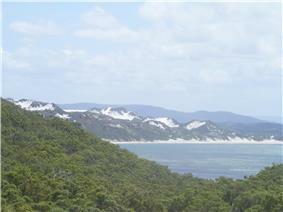 During periods of glaciation and resulting low sea levels, Cape York Peninsula provided a low-lying land link. Another link existed between Arnhem Land and New Guinea, at times enclosing an enormous freshwater lake (Lake Carpentaria) in the centre of what is now the Gulf of Carpentaria. In this way, Australia and New Guinea remained connected until the shallow Torres Strait was last flooded around 8,000 years ago. Cape York Peninsula supports a complex mosaic of intact tropical rainforests, tropical and subtropical grasslands, savannahs, and shrublands|tropical savannahs, heath lands, wetlands, wild rivers and mangrove swamps. These various habitats are home to about 3300 species of flowering plants and almost the entire area of Cape York Peninsula (99.6%) still retains its native vegetation and is little fragmented. Cape York Peninsula also contains one of the highest rates of endemism in Australia, with more than 260 endemic plant species found so far. Therefore, parts of the Peninsula have been noted for their exceptionally high wilderness quality. The flora of the peninsula includes original Gondwanan species, plants that have emerged since the breakup of Gondwana and species from Indo-Malaya and from across the Torres Strait in New Guinea with the most variety being found in the rainforest areas. Most of the Cape York Peninsula is drier than nearby New Guinea which limits the rainforest plants of that island from migrating across to Australia. The majority of Cape York Peninsula is covered in tropical and subtropical grasslands, savannahs, and shrublands|tropical savannah woodland consisting typically of a tall dense grass layer and varying densities of trees, dominantly eucalypts of which the most common is Darwin stringybark (Eucalyptus tetrodonta). Although abundant and fully functioning on the peninsula, tropical savannahs are now rare and highly degraded in other parts of the world. Tropical rainforests cover an area of 748 000 ha, or 5.6 percent of the total land area of Cape York Peninsula. Rainforests depend on some level of rainfall throughout the long Dry season, climatic conditions that are mostly found on the eastern slopes of the peninsula’s coastal ranges. Being almost exclusively untouched, old-growth forests and supporting a disproportionately high biodiversity including flora of Gondwanan and New Guinean origin, the rainforests are of high conservation significance. The largest contiguous rainforest area on the peninsula occurs in the McIllwraith Range-Iron Range area. The Gondwanan flora of this area includes Araucariaceae and Podocarpaceae conifers and Arthrochilus, Corybas, and Calochilus orchids. In all, this rainforest contains at least 1000 different plants, including 100 rare or threatened species, and 16% of Australia's orchid species. Carnivorous pitcher plant, Cape York Peninsula, Queensland, Australia. The peninsula harbours an extraordinary biodiversity, with more than 700 vertebrate land animal species of which 40 are endemic. As a result, from its geological history, "the flora and fauna of Cape York Peninsula are a complex mixture of Gondwanan relics, Australian isolationists and Asian or New Guinean invaders" (p. 41). Birds of the peninsula include buff-breasted buttonquail (Turnix olivii), golden-shouldered parrot (Psephotus chrysopterygius), lovely fairywren (Malurus amabilis), white-streaked honeyeater (Trichodere cockerelli), and yellow-spotted honeyeater (Meliphaga notata) while some such as pied oystercatcher are found in other parts of Australia but have important populations on the peninsula. The peninsula is also home to the eastern brown snake, one of the world's most venomous snakes. Mammals include the endangered rodent Bramble Cay melomys found only on Bramble Cay in the Torres Strait. The rainforests of the Iron Range support species that are also found in New Guinea, including the eclectus parrot and southern common cuscus. Other rainforest fauna includes 200 species of butterfly including 11 endemic butterflies one of which is the huge green birdwing, the green tree python and the northern quoll, a forest marsupial that is now severely depleted from eating the introduced poisonous cane toads. The riverbanks of the lowlands are home to specific wildlife of their own while the rivers including the Jardine, Jackson, Olive, Holroyd and the Wenlock are rich in fish. The wetlands and coastal mangroves are noted for their importance as a fish nursery and crocodile habitat, providing important drought refuge  and finally the Great Barrier Reef lies off the east coast and is an important marine habitat. Cattle station leases occupy about 57% of the total area, mostly located in central and eastern Cape York Peninsula. Indigenous land comprises about 20%, with the entire West coast being held under Native title. The remainder is mostly declared as National Park and managed by the Queensland Parks and Wildlife Service. Land uses include broad-acre pastoralism, bauxite and silica sand mining, nature reserves, tourism and fishing. There are extensive deposits of bauxite along the west or Gulf of Carpentaria coast. Weipa is the centre for mining. 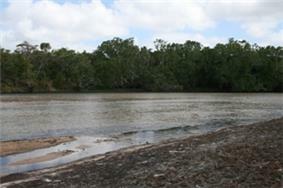 Much has been damaged by overgrazing, mining, poorly controlled fires and feral pigs, cane toads, weeds, and other introduced species but Cape York Peninsula remains fairly unspoilt with intact and healthy river systems and no recorded plant or animal extinction since European settlement. The first known contact between Europeans and Aborigines occurred on the west coast of the peninsula in 1606 but it was not settled by Europeans until the 19th century when fishing communities, then ranches and later mining towns were established. European settlement led to the displacement of Aboriginal communities and the arrival of Torres Strait Islanders on the mainland. Today the peninsula has a population of only about 18,000, of which a large percentage (~60 %) are Aborigines and Torres Strait Islanders. The administrative and commercial centre for much of Cape York Peninsula is Cooktown, located in its far southeastern corner while the peninsula’s largest settlement is the mining town Weipa on the Gulf of Carpentaria. The remainder is extremely sparsely populated, with about half the population living in very small settlements and cattle ranches. Along the Peninsula Developmental Road, there are small service centres at Lakeland, Laura and Coen. About 30 km offshore north of the tip of Cape York, there is a sizeable service centre on nearby Thursday Island. Aboriginal communities are at Hopevale, Pormpuraaw, Kowanyama, Aurukun, Lockhart River, Napranum, Mapoon, Injinoo, New Mapoon and Umagico. Torres Strait Islander communities on the mainland are at Bamaga and Seisia. A completely sealed inland road links Cairns and the Atherton Tableland to Lakeland Downs and Cooktown. The road north of Lakeland Downs to the tip of the Peninsula is sometimes cut after heavy rains during the wet season (roughly December to May). The Peninsula is a popular tourist destination in the Dry Season for camping, hiking, birdwatching and fishing enthusiasts. Many people make the adventurous, but rewarding, drive to the tip of Cape York, the northernmost point of mainland Australia. The total eclipse of the sun on 13 November 2012 UTC (14 November AEST), was visible from Cape York Peninsula, Australia, as well as some northern islands of New Zealand. ^ a b c d e f g h i j k Mackey, B. G., Nix, H., & Hitchcock, P. (2001). The natural heritage significance of Cape York Peninsula. Retrieved 15 January 2008, from epa.qld.gov.au. ^ a b c Joy, William (1964). The Explorers. Adelaide: Rigby Limited. p. 77. ^ a b c d e f Abrahams, H., Mulvaney, M., Glasco, D., Bugg, A. (1995). Areas of Conservation Significance on Cape York Peninsula. Cape York Peninsula Land Use Strategy. Office of the Co-ordinator General of Queensland,Australian Heritage Commission. Accessed 15 January 2008, from environment.gov.au. ^ a b Cofinas, M., Creighton, C. (2001). Australian Native Vegetation Assessment. National Land and Water Resources Audit. Accessed 20 April 2008, from anra.gov.au. ^ Australian Government. Australian Natural Resource Atlas. Accessed 20 April 2008, anra.gov.au. ^ Valentine, Peter S. (2006). Compiling a case for World Heritage on Cape York Peninsula. Retrieved 7 February 2008, from epa.qld.gov.au. ^ a b Cape York Peninsula Development Association. Homepage. Accessed 23 April 2008, cypda.com.au.